How long has it been since Biology class? The mere mention of it induces either sweaty palms or deep sleep. For many, it’s been too long and the material was neither clear nor interesting, yet the life issues demand a certain facility with biology. Beginning today, and on every Tuesday and Thursday this blog will have a column entitled Pro-Life Academy. It will begin with the fundamentals of biology necessary for discussing the life issues, and will advance over time into some more detailed aspects of science and medicine. At all times, the lessons will be concise, friendly, accessible and non sleep-inducing (hopefully). Building a strong command of the fundamentals needn’t be painful or stressful. We’ll keep it light but informative. The posts will build on each previous post and will be stored under “Pro-Life Academy” in the Categories panel. Questions are encouraged. There’s no such thing as a dumb question!!! Whether we are discussing sperm, egg, zygote, embryology, adult or embryonic stem cells, in vitro fertilization, the definition of death, it all comes back to a basic knowledge of the fundamentals-beginning with the most fundamental unit of life, the cell. Cells are the fundamental, the smallest units of life. The human body begins as a single cell, which gives rise to some 200 specialized types of cells that make up its complexity. Below is an illustration of an animal cell, with a wedge cut-away to afford us a view inside. If it looks pretty complicated, it is. But we’ll just focus on a few features. Nucleus– At the heart of the cell lies the nucleus. This organelle (little organ) is the vault where the blueprints of the cell (DNA) are stored. DNA– These are long strands of a chemical called deoxyribonucleic acid. Certain segments on each strand contain instructions, called genes, for building proteins. Proteins– are a large family of molecules in the cell whose members serve various functions, from cell skeleton, to receptors at the surface (like a satellite dish/transmitter tower) which enable the cell to communicate with the outside world, to enzymes which do the actual biochemical work of the cell. Genes– are the blueprints for building different proteins. The human cell contains over 30,000 different genes. Ribosomes– When proteins need to be made, working copies of the genes, called RNA, are made and sent to the carpenters of the cell responsible for building proteins out of their amino acid building blocks. These carpenters are the Ribosomes. That’s enough cell anatomy for now. A few important observations here. First, cells are extremely complex. Human cells carry on tens of thousands of biochemical reactions. 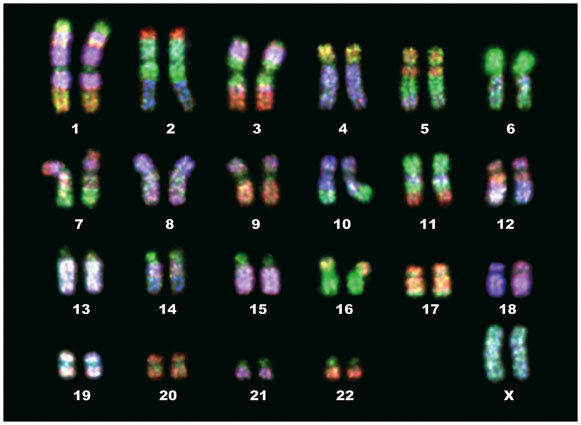 Next, not every gene is operational inside of every cell, even though every cell has a complete set of 23 pairs of chromosomes, shown in the karyotype below. This is vital in understanding stem cell technology, as we shall see. Essentially, certain clusters of genes are responsible for determining what type of cell a certain cell is. For example, a heart muscle cell’s genes for heart muscle function are turned on, while the genes responsible for making a nerve cell, or a skin cell are turned off. The very idea of skin cell reprogramming involves taking a skin cell and walking it backward developmentally to a point where one can direct the cell forward in a different developmental direction by aiding it in turning on certain genes, while turning off others. Perhaps we now want a cardiac muscle cell, instead of a skin cell. That’s the general idea that we’ll return to in the future. Welcome to the world of the cell! I do have a question. 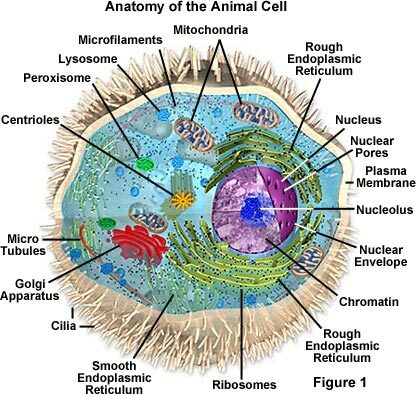 I have read some books whose authors speculate that the specialized organelles inside the eukaryotic cell, such as the human cell, were originally independent, less complex, cell structures, which were somehow assembled to form the large cell described here. Do you have any thoughts on whether that may be true, whether it is likely, why or how it may have come about? What you describe is the Endosymbiont Hypothesis. 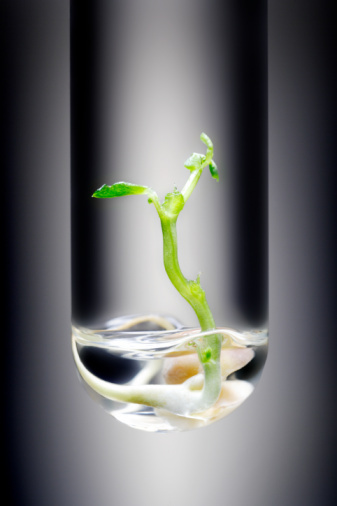 We believe that in the course of evolution the first cells were what are known as prokaryotes (bacteria). It’s believed that larger bacteria engulfed smaller bacteria resulting in a cell within a cell. If the arrangement was advantageous to both, then the cells survived and outcompeted others. The resulting conglomerates are referred to as eukaryotes. The evidence we have for this is that many organelles, such as the mitochondrion, have their own DNA and replicate independently, as bacteria do. It’s a good hypothesis with some pretty compelling data. This was a very enjoyable lesson #1. I look forward to seeing more!